An awesome 16 shot barrage from Epic Fireworks. There is only one effect from this barrage and it does exactly what it says on the tin, 16 shots of silver spiraling tails. When 2 are fired in a V, you get a great effect. Fantastic show starter. Packs a punch beyond its size. Nice height and broad silver spirals. Launched one today (Oct 19th) as a tester, and got claps and a whistle of approval from a neighbor. A good, low-noise purchase. excellent piece, video doesnt do it justice, i fired 3 of these flanked by a couple of silver fountains, had the crowd oohing and ahhing. Great price!! Excellent piece from Black Cat. 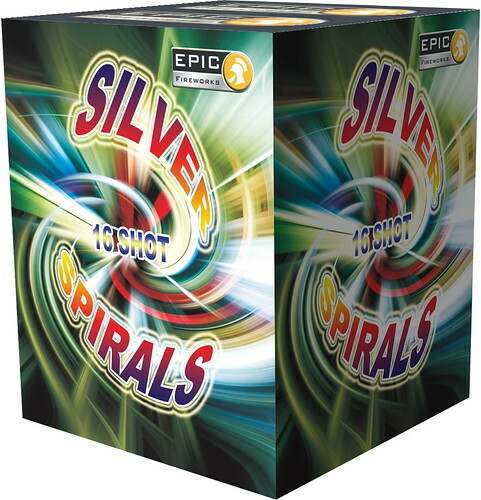 Silver spiralling spinners with surprisingly large bursts and great pace make this a winner! Several of these would work very well in a larger display. Great effects and superb value for money!